A few weeks ago the latest expansion for World of Warcraft launched, 'Legion'. I make no attempt to hide or excuse the fact I play World of Warcraft having done so for the last ten years. I'm an MMO gamer. I love community-involved games, and I love the particular Universe World of Warcraft is set in. I loved the movie, even if the critics didn't. My experience this last week with issues in the game however, I did not love. Neither did other players. As a preface for this, it is worth telling people who don't know that World of Warcraft is the world's largest subscription MMO (Massive Multiplayer Online) game in the world, with approximately 5.5 million subscribers, who pay USD$10 per month to play along with other in-game cash services for vanity items, or character changes/moves/power-ups that range from USD$10 to USD$50. Suffice it to say, it makes alot of money for Activision who own Blizzard, somewhere around the USD$100m per year mark at a very very rough estimate for a twelve-year-old game. So this should set some business perspective here. So there I was on the Tuesday of the release, with a few days out of the office for my biennial timeout to get a good solid week of levelling in the new expansion in. Like every World of Warcraft expansion to date, the launch wasn't smooth. Server capacity issues, one to three hour queue times in the EU region just to get access to your characters to play them at certain times, insane lag (which to be fair was the result of them getting hit with a massive DDoS -because some people just won't let other people have fun & play video games). The most frustrating thing about Blizzard for all the great things they do, the customer experience side of things for a decade as an EU player has been nothing short of terrible. One of the biggest issues I've had for many years is their insistence of driving people to their twitter account to get updates of what's going on. Not everyone uses twitter. Not everyone wants to use twitter. Twitter is a terrible way to communicate quality-of-life issues to your customers as it takes a wrongful assumption people use twitter or will spot these issues. I play a Paladin (Alliance - boo me all you want, Retribution/Protection spec), & my realm is Silvermoon EU. We have the second most populated realm in the EU region for the game at almost 618,000 characters behind Outland, which has a mind-boggling 778,576 characters. 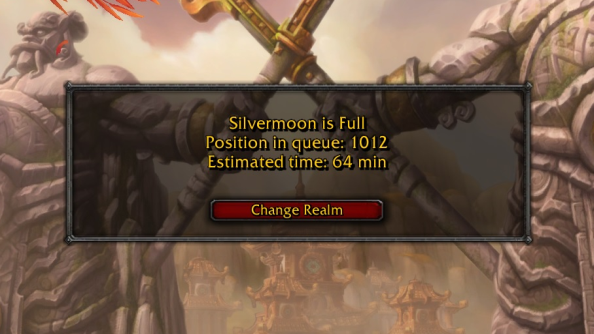 Silvermoon over a day will see thousands of players (who have several characters each) log in. Pretty much the same experience daily. I can kinda deal with this as it gives me a chance to also catch up on shows I'm watching on NetFlix as I wait ('Power, Season 3' for those who care). But, seeing the forums, people really resented the lack of updates to what was going on. And this is just from their own official forums. Nevermind other large unofficial community forums such as MMO Champion. For issues with any of the games, they send people to Twitter. It would be much better if their launcher integrated with a hosted status service which was linked to monitoring systems to reflect the status of what was going on. In the MMORPG space, Blizzard's World of Warcraft still reigns supreme when other contenders have come in to knock it off its throne such as 'Star Wars: The Old Republic' (the most expensive game ever developed excluding marketing costs), EVE (which we're big fans of here too) Rift (which I play occasionally during content droughts in World of Warcraft), Guild Wars 2, Tera, ArcheAge, Neverwinter, The Secret World (which during BETA I loved, but on release I found forgettable) & of course, Lord of The Rings Online. The one area I find with World of Warcraft Blizzard have progressively gone backwards with is customer experience despite the gaming experience getting better (and with this expansion, boy has it gotten exponentially better after the last expansions 'Garrison-solitude'. If you have a game where it's freemium or subscription, not having a status page to me is not only selling your players short but selling your game short too. Whether armed with swords and shields, or blasters or casting the mother of all spells to take down your foes, your game needs a status page.